Dr. Siegal's Direct Nutritionals, LLC, the exclusive worldwide distributor of Dr. Siegal's COOKIE DIET® hunger-controlling foods and operator of CookieDiet.com, today announced that it has licensed Boca Raton, Florida-based Triple A Products, LLC, manufacturer of VITAZEST® Water, to identify its zero-calorie vitamin-enriched Green Tea with honey and lemon beverage as compatible with Dr. Siegal's COOKIE DIET® products. Under the arrangement, Triple A Products has added to the label of its VITAZEST® Water Brand Green Tea a special logo that identifies the beverage as being compatible with Dr. Siegal's COOKIE DIET® hunger-controlling diet cookies and diet shake mixes. The product is also the first third-party product to be sold on the CookieDiet.com Web site. "Our customers are clamoring for new food and beverage products and we're working hard to deliver. In addition to developing new products personally engineered by Dr. Sanford Siegal, we're now allowing manufacturers of products that are compatible with ours to indicate so on their labels," said DSDN president and CEO Matthew Siegal. "With zero calories, carbs, and fat, VITAZEST® Water Brand Green Tea is ideal for anyone who is serious about losing or maintaining weight with Dr. Siegal's COOKIE DIET® cookies and shakes." Siegal added that the beverage is for hydration and pleasure only and is not a hunger-controlling food intended to substitute for Dr. Siegal's cookies and shakes. In order to be considered compatible with Dr. Siegal's COOKIE DIET® products, a beverage must contain zero carbohydrates, calories and fat per serving. "Everyone is aware of the importance of proper hydration, especially on a reduced-calorie diet. VITAZEST® Water Brand Green Tea supports hydration whether or not one is on a diet, and tea connoisseurs love the taste," said Dr. Siegal. Dr. Siegal's program features his hunger-suppressing cookies, shakes, and soup which contain his secret blend of certain amino acids, the basic components of food proteins. He conceived the idea of a cookie-based diet in the early 1970's while writing a book on food substances that suppress hunger without drugs. In 1975, after years of experimentation on family and friends, he perfected his proprietary formula and baked it into a cookie. 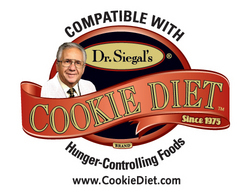 Acceptance by his patients was immediate and soon Dr. Siegal's COOKIE DIET® was the exclusive approach to weight loss at Siegal Medical Group. More than 200 other doctors have used Dr. Siegal's COOKIE DIET® hunger-controlling cookies, shakes, and soup in their own practices. Although Dr. Siegal's COOKIE DIET® has helped hundreds of thousands of people lose weight since 1975, the products only became available to the general public at retail in May 2007. Due to the immediate success of the company's Web site, CookieDiet.com, and its eight retail locations, the business media has begun to take notice. Dr. Siegal and his son, Matthew, who is the company's president and CEO, were recent guests on the Fox Business Happy Hour. Last Monday, Matthew Siegal was the subject of a column entitled "Value Added: The Cookie Diet Hits the Web" by Washington Post columnist Thomas Heath. Dr. Siegal's COOKIE DIET® hunger-controlling foods and nutritional supplements are available online at http://www.CookieDiet.com; by phone 24/7 at 877-377-4342 toll-free; and from more than 100 doctors, drug stores and other retailers. They're also available at Dr. Siegal's COOKIE DIET® kiosks in Paradise Valley Mall, Chandler Fashion Center, and Scottsdale Fashion Square in Phoenix, AZ; Boca Raton Town Center Mall in Boca Raton, FL; Dadeland Mall in Miami, FL; The Galleria Mall in Ft. Lauderdale, FL; Tysons Corner Center in McLean, VA; and Cherry Hill Mall in Cherry Hill, NJ. A ninth location will open in Beverly Hills in September 2008. VITAZEST® Water is a premium vitamin enriched beverage with no carbs, no calories, no sugar, and no sodium. This refreshing, healthy drink is perfect for the health conscious consumer and exceeds expectation in both nutritional value and great taste, providing 10 vitamins and minerals in every bottle. VITAZEST® Water is available in 6 delicious flavors: Pomegranate, Blueberry, Kiwi Strawberry, Passion Fruit, Pineapple Mango and Green Tea and comes in a 20 oz size. The flavors are derived from natural fruit and green tea essences. VITAZEST® Water is compatible with all diets. And, VITAZEST® Water is diabetes friendly. VITAZEST® Water is produced by Boca Raton, Florida-based Triple A Products, LLC, which has regional offices in Lake Success, New York. For more information, please visit http://www.drinkvitazest.com.